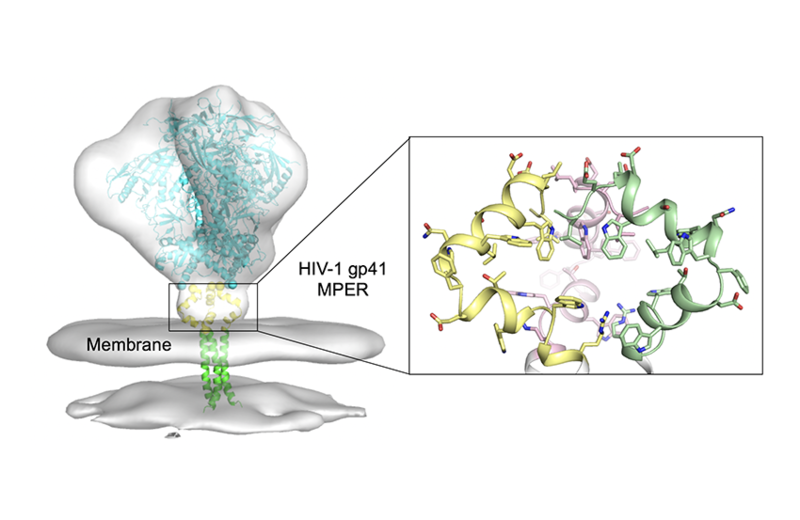 Scientists at Harvard Medical School and Boston Children’s Hospital have determined the atomic structure of a key part of HIV-1 envelope proteins, the knob-like projections that attach the viruses to the cells they infect. The study fills in one of the last missing pieces of envelope protein structure: the segment that anchors the protein to the viral membrane. “The structural complexity and rapid mutation of the envelope protein have been formidable challenges for vaccine development,” said Stephen C. Harrison, the Giovanni Armenise – Harvard Professor of Basic Biomedical Science at HMS, professor of pediatrics at Boston Children’s and coauthor of the study. “People have been trying really hard for 30 years with every technology they can get their hands on to capture the structure of the whole thing,” added James J. Chou, professor of biological chemistry and molecular pharmacology at HMS and co-senior author of the study. An estimated 36.7 million people around the world have HIV/AIDS, 1.2 million of them in the United States. While there are effective drugs to treat the disease, there is no cure; patients must take pills every day for life to keep the infection in check. Medications can also help people at high risk reduce their chances of contracting HIV, although that similarly involves daily pill-taking. Researchers have been striving to develop a vaccine that would prevent HIV from establishing a foothold in the first place. They aim to stop the virus before it attaches to a T cell. HIV offers just one target for vaccine-induced antibodies: its envelope proteins. They are the only antigens—molecules that trigger antibody production—on the virus’ surface. Accordingly, researchers have been toiling for decades to reveal the precise structure of the envelope protein so they can design vaccines that guide the immune system to produce antibodies against it. Specifically, researchers want to knowits pre-fusion structure. The envelope protein undergoes several shape changes after the virus attaches to a T cell but before it fuses with the T-cell membrane. If an antibody targeted one of those later conformations, it would fight HIV only after infection had begun. The envelope protein is shaped like a mushroom rooted in the membrane enclosing the virus. Most interest has focused on the outermost portion—the mushroom’s cap—called the ectodomain, shown above in blue. Researchers have determined the ectodomain structure in intricate detail, and it is the target of HIV vaccines currently in clinical trials. The structures of the MPER (shown in yellow), which lies between the mushroom cap and stem, and of the segment of the mushroom stem located in the membrane (shown in part, in green), had only vaguely been sketched out until recently. Their proximity to the oily viral membrane made them hard to study. Chou’s expertise in a technique called nuclear magnetic resonance, or NMR, helped crack the problem. In 2016, Chou and Chen showed that the transmembrane segment forms a trimer, or three identical parts. They further demonstrated that it plays a critical role in maintaining the envelope protein’s pre-fusion structure. The transmembrane segment does not present a useful target for vaccines, however, because it is buried out of reach. In the new study, the team at last succeeded in determining a full, high-resolution structure of the MPER in its natural context along with the transmembrane segment and the membrane itself. As important as uncovering the structure itself was the team’s discovery that the MPER lies exposed outside the viral membrane. Earlier studies had disagreed on whether the MPER was hidden in the membrane. Because the MPER has a well-organized structure that remains highly consistent across many strains of HIV-1 around the world, the researchers believe it has significant potential. Vaccines take many years to develop, and success is not guaranteed. For now, the team is investigating whether they can use their new knowledge to lock the MPER in its pre-fusion conformation and train the immune system to produce antibodies against the MPER in animal models. This study was supported by the National Institutes of Health (grants AI127193, AI106488, AI129721), the Center for HIV/AIDS Vaccine Immunology and Immunogen Discovery (grant AI-100645), a Merck Fellowship and a Collaboration for AIDS Vaccine Discovery grant (OPP1169339) from the Bill and Melinda Gates Foundation. Harrison is a Howard Hughes Medical Institute investigator. PrécédentPrécédentComment suivre un cours pour bien le mémoriser ?